Delphi, a town on the slopes of Mount Parnassus in Greece, was the site of the main temple of Apollo* and of the Delphic oracle, the most famous oracle of ancient times. Before making important decisions, Greeks and other peoples traveled to this sacred place to consult the oracle and learn the gods' wishes. According to Greek mythology, Zeus* wanted to locate the exact center of the world. To do this, he released two eagles from opposite ends of the earth. The eagles met at Delphi. Zeus marked the spot with a large, egg-shaped stone called the omphalos, meaning "navel." 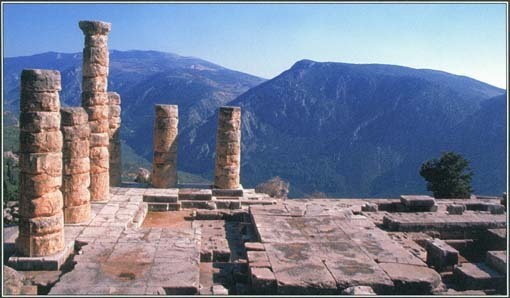 Originally, Delphi was the site of an oracle of the earth goddess Gaia. The site was guarded by a monstrous serpent (or dragon, in some accounts) called Pytho. Apollo killed Pytho and forced Gaia to leave Delphi. Thereafter, the temple at Delphi belonged to Apollo's oracle. Consulting the Oracle. No one knows for certain how the process of consulting the Delphic oracle worked. However, over the years, a traditional account has been widely accepted. According to this description, a visitor who wanted to submit a question to the oracle would first make an appropriate offering and sacrifice a goat. Then a priestess known as the Pythia would take the visitor's question into the inner part of Apollo's temple, which contained the omphalos and a golden statue of Apollo. Seated on a three-legged stool, the priestess would fall into a trance. After some time, the priestess would start to writhe around and foam at the mouth. In a frenzy, she would begin to voice strange words and sounds. Priests and interpreters would listen carefully and record her words in verse or in prose. The message was then passed on to the visitor who had posed the question. Some modern scholars believe that the priestess did not become delirious but rather sat quietly as she delivered her divine message. Anyone could approach the oracle, whether king, public official, or private citizen. At first, a person could consult the oracle only once a year, but this restriction was later changed to once a month. Influence of the Oracle. The ancient Greeks had complete faith in the oracle's words, even though the meaning of the message was often unclear. As the oracle's fame spread, people came from all over the Mediterranean region seeking advice. Numerous well-known figures of history and mythology visited Delphi, including Socrates and Oedipus. Visitors would ask not only about private matters but also about affairs of state. As a result, the oracle at Delphi had great influence on political, economic, and religious events. Moreover, Delphi itself became rich from the gifts sent by many believers. The cult of Apollo at Delphi probably dates back to the 700s B . C ., although the fame of the oracle did not reach its peak until the 500s B . C . In about 590 B . C ., war broke out between Delphi and the nearby town of Crisa because Crisa had been demanding that visitors to the Delphic oracle pay taxes. The war destroyed Crisa and opened free access to Delphi. To celebrate the victory, Delphi introduced the Pythian Games, an athletic festival that took place every four years. Many rulers consulted the oracle at Delphi about political matters, such as whether to wage a war or establish a colony. However, the oracle's answers were often vague or ambiguous, leaving interpretation to the listener. Sometimes such uncertainty had ironic results. For example, King Croesus of Lydia asked the oracle if he should attack Cyrus the Great of Persia. The oracle responded that such an attack would destroy a great empire. Croesus attacked, expecting victory. However, his own forces were overwhelmed, and it was the Lydian empire of Croesus that was destroyed. In early Roman times, Delphi was often plundered. For example, the Roman dictator Sulla took many of Delphi's treasures, and the emperor Nero is said to have carried off some 500 bronze statues. With Rome's conquest of Greece and the spread of Christianity, Delphi's importance declined. The oracle was finally silenced in A . D . 390 to discourage the spread of pagan beliefs. The temple of Apollo on Mount Parnassus in Greece was the site of the Delphic oracle. People from many lands went there to ask the oracle for advice. The modern village of Kastri stood on the site of ancient Delphi until 1890. Then the Greek government moved the village to a nearby location, making the site of the ancient town available for excavation. Archaeologists have been working on the site since that time and have made many important discoveries relating to the temple of Apollo. See also Apollo ; Gaia .